Marvel Superheroes was an interesting concept for a comic book. One new story plus two classic reprints. Sounds like the successful Archie digest format, doesn't it? 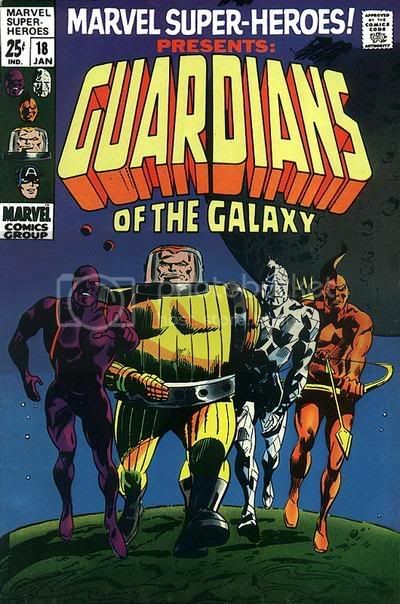 In any event, #18 is the first appearance of the Guardians of the Galaxy, and it is a good comic. Of course, you wouldn't know it by the cover, for while Gene Colan's interior art is quite good, his designs could use a little work. I think every single character looks ridiculous (and it comes as no surprise that all but one of the characters went through SIGNIFICANT redesign work in future appearances). In any event, except for the designs, every other aspect of the comic is awesome. If a comic writer ever needed a primer on how to create an entirely new hero concept in an entirely new comic universe all in ONE issue - this story by Arnold Drake is the one. The basic concept is this, an evil alien race named the Badoon is conquering the Milky Way Galaxy in the 31th Century. Teaming up to stop them is a man from Jupiter, a man from Pluto, a man from Centauri IV and an Earthman born 1000 years ago. If that's not a super cool sounding team, then I don't know what IS. Meanwhile, Drake must have been reading some science articles recently, because he tried to work in extra little science-based riffs. Like Charlie-27's body, like all people from Jupiter, has become massive due to the atmosphere of Jupiter. Likewise, Martinex, the man from Pluto, also has undergone body changes like the rest of his people (and I just LOVE the way that Drake doesn't just say "he shoots fire out of one hand and ice out of the other," but instead tries to give a detailed scientific reason for WHY it works like that...hehe). Vance Astro was placed into cyrogenic stasis to go on an interstellar flight. When he arrived at his destination 1000 years later, he was greeted by other Earth people, as someone had discovered a quicker way of space travel 800 years earlier! Yondu is a member of the species found on the planet Astro landed on. When his people were slaughtered by the Badooon, he went with Astro to Earth, which is where all four men met up together and decided to band together. What great art (except for the costumes). And Drake also throws in great little touches, like the simmering racial prejudice between the people from the different planet colonies (apparantly Jupiter-folk don't like Pluto-folk) and the weird relationship between Vance and Yondu. Also, Drake uses cool science-fiction terms like "radio-jump," "space-migration" and "space-militia." This was great as it was not just a great SETUP issue, but a good issue period. And then the reprints are just BONUS (which is good, as they were not particularly good)!! I was probably too fond of the Valentino relaunch in the early 90s... I'd buy an Essential Guardians in a second. Arnold Drake created the Guardians? Wow. Yeah, Dan, isn't that so trippy? 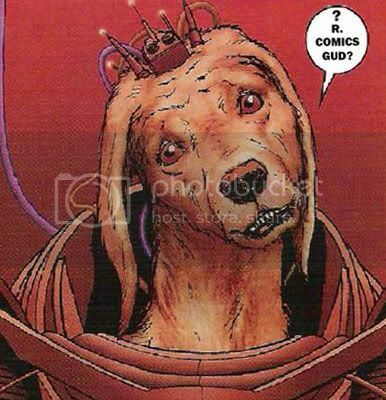 I have read a LOT of Guardians of the Galaxy comics, and I never knew that until I actually checked the credits this time. Hey! It's that sense of wonder! I heed the sweet siren-call of nostalgia!